Alex and Dawn are both working on Comcast WiFi survey work in a variety of markets. The virtual survey is conducted via Google Maps using Street View to look for suitable sites to place WiFi hotspots. Using a list of suggested targets, the surveyor locates it on Google Maps and examines the area for available cable (plant) and to make sure that the target can be covered from the nearest placement location. Screen shots and other data is collected in a database. Once an area has been surveyed virtually, the sites are turned over to a field team that goes out to validate the locations, capture additional pictures and GPS coordinates, along with pole information. Alex went west again to assist with WiFi survey work in Sacramento CA. Over two weeks, Alex visited Sacrament, Modesto, Stockton, Paradise, Chico, Yuba City, and Oakland. Conducted survey work for 650 WiFi sites for Comcast and BIG Wireless. When this work is finished, Comcast customers will have access to WiFi in public locations such as restaurants, ball parks, parks, hospitals, and schools. Alex & Dawn attended the Poconos EMS Conference. Great education was to be had and as always, the staff of the Eastern EMS Region was beyond compare. While there, Alex presented a session titled “Vitals: Beyond the Basics.” About 60 people attended. Alex and Dawn also competed in the CPR challenge. Alex took first place amongst the competitors. Looking forward to attending again next year. Alex went to the west coast to assist with WiFi survey work in San Jose, Mountain View, Palo Alto, and the Monterrey/Salinas area. Spent about two weeks out there in absolutely marvelous weather. Surveyed over 700 sites. When this effort is finished, Comcast customers in that area will be able to access WiFi services while in public areas we surveyed. Alex presented at the annual PA State EMS Conference sponsored by PEHSC. Alex presented at the Altoona event. His topic was “Street Drugs – Current Trends.” About 70 people attended the presentation. Nothing like Macon Georgia in the dead of summer! 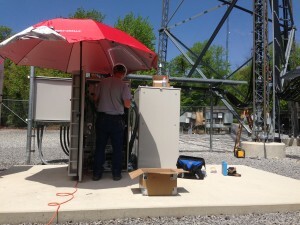 With temperatures exceeding 100 degrees some days, we spent 2 weeks in Macon installing microwave antennas for Alcatel-Lucent and BIG Wireless. We installed 6 antennas at three sites to support the roll out of Macon County’s new 911 communications system (P25 Harris network). 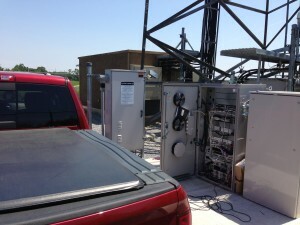 Each install was on a guyed-tower at heights up to 250′ above ground level. The towers themselves were 400′-650′ in height. One site was remote enough we spotted wild boar running near by. The one to the left was the 650′ tower. 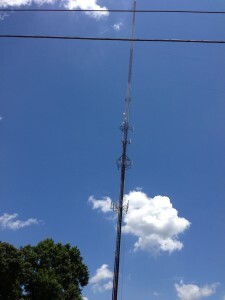 Our installs were at 115′ and 235′ on this tower. 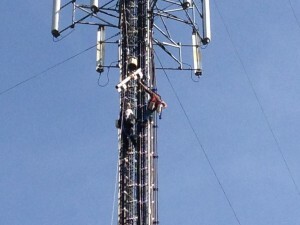 Crew from HNS Telecom (Gary & Dave) at 115′ AGL installing the mounts for one of the antennas. Getting ready to raise a 6′ diameter microwave antenna to 235′. These weigh over 200 lbs. Good thing it was a calm day, even if it was over 95 degrees with humidity approaching 98%. Never say we have a dull moment: While on the way to Macon, Alex was just outside of Florence SC on I20 headed westbound when he encountered a single vehicle accident. A large passenger van had been traveling east bound and went off the road, up an embankment, and rolled and rotated multiple times. Of the 11 passengers, at least 6 had been ejected. No first responders were on scene yet. Alex stopped and worked with several truckers and two registered nurses to start triage and providing aid until first responders arrived. Upon their arrival, the incident was turned over to them and Alex stayed to assist until all 11 passengers were safely on board ambulances or helicopters. Two of the victims were in pretty bad shape. Only one victim spoke any English which made triage a little more challenging (and Alex does not speak Ethiopian, their native language). 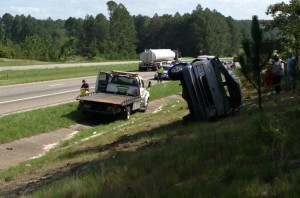 Picture taken by news crews after the scene had been cleared of victims. 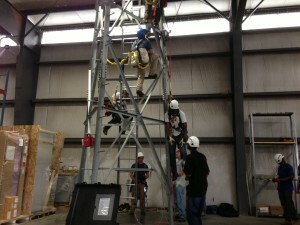 In June of 2013, Alex Wilson completed a ComTrain course on Tower Rescue and Climbing. Great class with some great instructors. Nice chance to network with peers in the industry. Practicing tower rescues on a training tower. Actually had to assist with a real rescue as one of the students overheated and suffered heat exhaustion while on top of the training tower. Alex assessed the student once rescued and continued to monitor others. Working with a great team of tower climbers and engineers, we just wrapped up the installation of microwave antennas to support the roll out of 4G/LTE for Shentel and Sprint. Microwave antenna units were installed at heights up to 270′ above ground level. 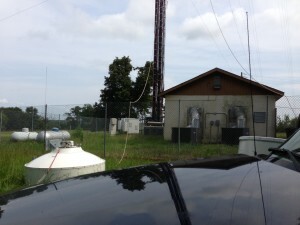 We visited over 60 cell tower sites in PA, MD, VA, and WV. Some of the sites we visited included Hershey, Hanover, York, Hellam, Camp Hill, Chambersburg, Spring Grove, McConnellsburg, Hagerstown, Green Castle, Inwood, and Winchester. On the Eastern Shore we visited Chestertown, Denton, Easton, Wye Mills, and more. Alex’s truck park alongside a cabinet, conducting testing of the microwave radios in Spring Grove PA. On a hot summer day, the air conditioning in the truck was a blessing. 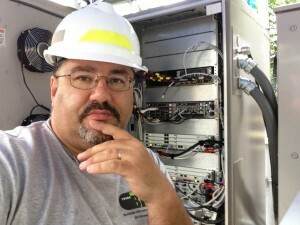 One of our contractors, Paul Storke, working on installing the gear in a cabinet on top of Tuscarora Mountain in McConnellsburg PA. The site was 2,350 feet above sea level and the tower went up another 200 feet. Alex doing some thinking while trying to troubleshoot an installation problem. 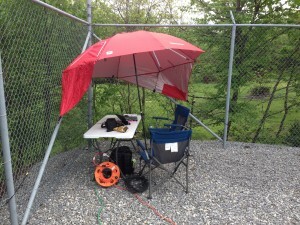 At the base of a 247′ tower in McConnellsburg PA.
Alex’s office and work area for programming radios on Tuscarora Mountain above McConnellsburg PA.